In Tokyo Bay, conger tube-trap fishers voluntarily deployed escape holes of at least 13 mm diameter to reduce the by-catch of young conger smaller than the marketable size of 35 cm total length. 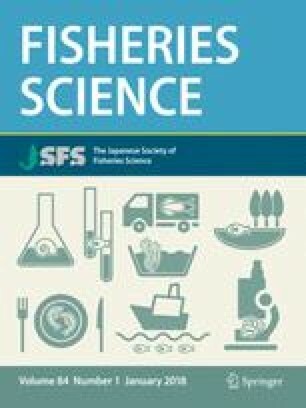 Comparative fishing experiments in Tokyo Bay were carried out using tube traps with seven hole diameters (3, 9, 13.5, 14, 15, 17, and 19 mm), to obtain the size-selectivity of the escape-hole size for inshore hagfish Eptatretus burgeri and white-spotted conger Conger myriaster. On the assumption of the geometrical similarity in the combination of body g and hole perimeter m at a given retention probability, a single master curve s(R)=exp(−13.52+11.31R)/(1+exp[−13.52+11.31R]) was estimated for the two species in terms of relative R=g/m using the Share Each LEngth’s Catch Total (SELECT) process based on a multinomial distribution. Almost all conger and hagfish with a girth equivalent to the hole perimeter were able to pass through the hole. Thus, the two species have a high ability to escape through a narrow space by squeezing the body through the hole in the rigid PVC tube. Optimum escape-hole size is discussed from several objectives for conger tube-trap fishery management, e.g. reduction of hagfish by-catch. This study also specifies the conditions for pooling data when fishing experiments using more than two fishing gears are replicated.